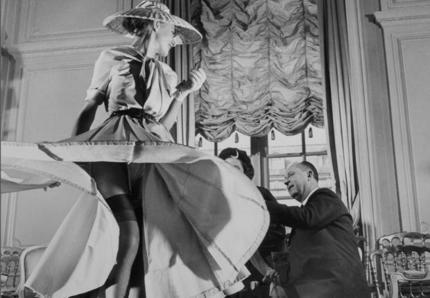 Christian Dior had an incredible intuition that led him to ultimate success. His first couture house opened in 1946, after the WWII. He was able to capitalize on a depressed mood of post war France and give women a new image. His friend back in childhood once said “The magic name consists of words God and Gold”. The Parisian elite was simply stunned when the 90 models started to defile the runway decorated with pale gray and white stucco in the style of Louis XVI. Rumours of this collection swell quickly throughout France. Christian Dior at the time was an ordinary tailor in a model house Lucien Lelong. Sculpted shoulders, thin waist, rounded hips, developing long skirts, a veil that hides your eyes, gloves and a light step – conveyed the image of the femininity, which was lacking during the war. Almighty editor in chief of Harper’s Bazar Caramel Snow enthusiastically declared: “Dear Christian, this is totally new look!” That was enough to ensure that expression was used throughout the world. Although Christian Dior died soon of a heart attack at age of 52, he died as famous as Ghandi. He was an admired “boss”, generous and happy. He led a quiet life trying to keep his private life away from the public. He had many friends and had tight relationships with many of them. “Women will help you succeed” one friend once said. Christian Dior learnt to listen to what people say and analyze. He tried to be ahead of the others. Christian Dior, born in 1905 in Normandy, was a son of a rich chemical fertilizer factory owner. His mother, a woman of very strict traditional background, didn’t get along with her son very well. When she ordered to grow a garden around their family mansion, Christian volunteered to help or order to find a common interest with her. Gardening turned into a lifelong love of flowers. He used flowers in his designs and lily, his favourite, to pluck the buttonhole instead of an ordinary button. Since that time he became interested in the style of Louis XVI, light and bright, which made decorations in a private hotel on the Dior Montaigne Avenue. Because of his disapproving mother who wanted him to be an architect or a diplomat, Dior lived in the shadow of his creative friends, even after opening his own art gallery sponsored by his father. A present came with one condition – the designer was not allowed to hang out the name of Dior on the facade, because Christian’s mother was ashamed of his son. After 1929, when his family lost their wealth, a hard time began for Christian Dior – a life in the house without electricity, running water and a leaking roof. Freed, to some extent from the power of the controlling personality of his mother, he finally decided to take up design. So he lived, working hard until age of 40 when Marcel Boussac knocked as his door offering a position in his company. Dior’s talents shined to their fullest and his genius design skills got combined with his business ego. Today, sixty years later, Christian Dior is a leading fashion house, now part of Mot Hennessy Louis Vuitton. Cocteau was right, Dior name is worth a name of Gold. Today John Galliano is a lead designer of Haute D’Dior. He has been working in this position for 20 years. Energetic Galliano, just like Christian Dior, came out by surprise and has proven to be worthy of continuing Dior tradition. Both Dior Sunglasses and John Galliano Sunglasses are available in our store along with prescription Dior Eyeglasses frames. Some of the most beautiful are for preview below.